I love my friends just as they are, but… I’m not ashamed to admit that I love them more when they give me chocolate. I’m less ashamed to admit that I love them even more when they give me LOTS and LOTS of chocolate. For some background on this post, I recently attended a friend’s wedding in Boston. Checking in at the front desk, the concierge said the standard, “Here are your keys – you are all set.” Instead of leaving it at that like usual, he quickly followed it up with, “Oh and this is for you”, setting a wrapped box on the counter. My friend (the groom), who recently moved to the UK took the time to collect a stash of foreign chocolate bars for me and brought them back with him to the US in time for my birthday. I could barely keep my composure as I opened the box to discover over a dozen luxurious chocolate bars. It’s a good thing that we had his wedding to attend, because otherwise I might have just thrown on the hotel bath robe, hung the “do not disturb” sign, put my feet up and called it a day, chocolate box in hand. Details on each bar are below, but I’m going to give you the very important takeaway of this post first: the next time you want to give someone something special, give them chocolate. It’s delicious and it’s easy – what’s not to love? Sure, there are those few random freaks out there that don’t like the stuff, but generally speaking it will likely make that special person in your life very happy. Especially if that person is me! And now, let’s get down to specifics. Onto the bars! The Green & Black’s Organic Classic Collection was a fun box to have not only because it contains a lovely variety of flavors, but because it contains two of each flavor, so if you really love one and devour it quickly, you get a second crack at it. Or for inexplicable reasons, you can share the second one (but I don’t recommend this). Side note: I love mini things because they make me feel giant. These bars are not much bigger than the tip of your thumb, but good things come in small packages and they are all packed with flavor. As a proud self-declared dark chocolate loyalist, this box genuinely surprised me because I think I may have preferred the milk chocolate bars in the collection over the dark. The almond bar has a really nice texture – the almonds are broken up so it’s kind of a cross between a nut bar and a crunch bar. I suspect that I could easily house an entire large bar of this flavor. The butterscotch bar is just plain out of this world. I think this is a bar that would suit anyone from casual chocolate eaters to straight up chocoholics like myself. It is creamy, with crunchy caramelized bits of butterscotch and has just the right hit of salt. This bar is what chocolate dreams are made of. 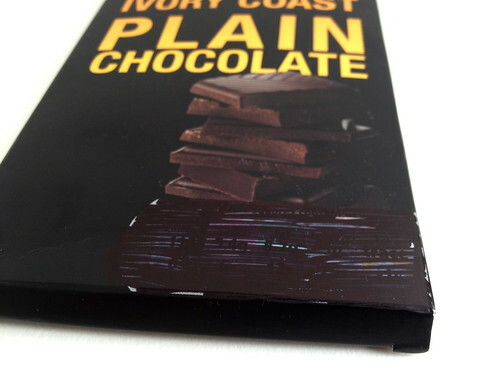 The milk chocolate wasn’t the only strong point, though – I did completely devour the dark chocolate cherry bars. But that is one of my pre-inclined favorite combinations, so no surprise there. The dark Tesco bar had a deep cocoa flavor and smooth texture and I found myself returning to the box for more of it with increasing urgency. The only real qualm I have with them is for putting the calories on the front of the package. Seriously- who wants to see that? NO ONE. It’s cool though – nothing a little Sharpie action can’t fix. On the same note, expiration dates on chocolate also make me laugh. Seriously, I’d like to meet the person who holds on to chocolate for so long that it expires. That is, I’d like to meet them and politely suggest that they see a therapist- or a chocolatier, since they are one in the same, right? Moving on to the next batch. There’s lots to cover! 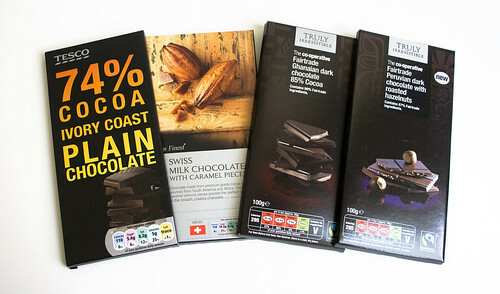 There were two bars from Truly Irresistible (pictured above) which is a sub-brand of The Co-operative supermarket, produced by Divine Chocolate. One of the bars was Fair trade Peruvian Dark Chocolate with Roasted Hazelnuts. It is surprisingly sweet for an 87% cocoa bar. The texture of the minced, roasted hazelnuts is fun to eat… maybe a little too fun. Though, I have a qualm with this chocolate packaging as well; on the back it reads (and I’m sure this is mandatory text but still), “Frequent eating of sweets and sugary snacks may lead to tooth decay and poor nutrition.” Nice. Way to rain on my chocolate hazelnut parade. The other Truly Irresistible bar was a Fairtrade Ghanaian Dark Chocolate 85% Cocoa Bar. This one was very dark and maybe a touch chalky on it’s own, but it tasted great mixed into my morning soy lattes. I just crumbled a bit of it into the warm espresso along with a sprinkle of sugar, whirred it with an electric frother and added soy milk. YUM. These were all special bars in their own way, but I think I saved the best bunch for last. The Choka Blok Bars were each their own little adventure. My friend (aka the enabler) described them as “irresponsible” which is fairly accurate. From the names (“Gold Digger Dynamite“) to the ingredients (milk & white chocolate swirled together in a chunky blok, packed with milk chocolate caramel cups & chunks of sweet honeycomb) they were fun to open, fun to see the ridiculous swirls of ingredients in the chocolate and fun to eat. Needless to say, these did not last long in my clutches. The Gold Digger is sweet and creamy with just enough stick-to-your-teeth crunch. 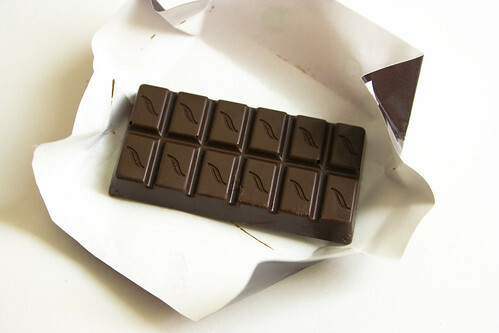 As awesome as that one is though, The Chocolate Extremist Bar was the first bar of the entire collection to meet its end. As a brownie lover, how could I resist “a dense blok of smooth milk chocolate swirled with rich dark chocolate, crunchy brownie pieces & milk chocolate malt balls”. Answer: I couldn’t. Everything about this bar adds up to a lovely package – creamy multi-layered chocolate with intense crunchy add-ins. All three Choka Blok bars were well-balanced and fun to eat, plus I think they’d make great gifts for just about any sweets lover. Sometimes the fancier bars in more serious packaging that brag about dark percentages seem intimidating to chocolate novices, but these would be fun and approachable for anyone. Yeah… that brownie one didn’t even make it to the photoshoot in one piece. Yum. The 3rd Choka Blok Bar went quickly as well. 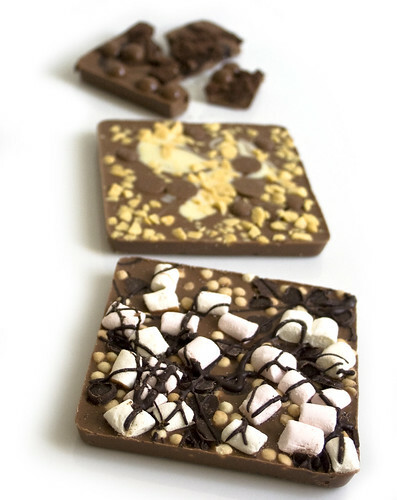 It’s called “The Rocky Road of Love” (aww) and is made up of a chunky blok of milk chocolate loaded with dark chocolate hearts, crunchy shortcake biscuit balls and mini marshmallows, drizzled with dark chocolate. I don’t know whose cooky idea it was to make “crunchy shortcake biscuit balls” but I applaud them. They are crunchy and had a lot more flavor than the usual crisps in chocolate bars do. Bravo! After these three bars were gone, I honestly had trouble parting with their wrappers. I think I was subconsciously hoping that if I put them under my pillow at night and woke up in the morning, the chocolate inside would have magically re-appeared. I blame said delusions on the sugar coma that resulted from my shameless chocolate consumption. And to any of you lucky brits out there, they make ice cream too. Ugh! The jealousy is painful. 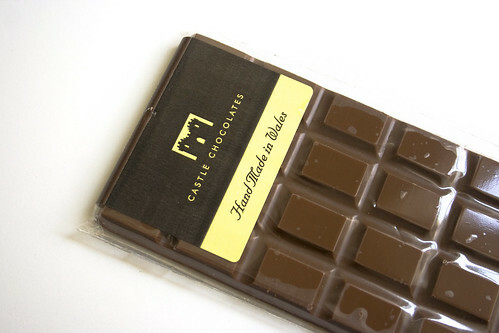 After all of those crazy flavors, I will admit to not being wildly impressed with this adorable Handmade Milk Chocolate bar from Castle Chocolates, which is based in Wales. There was something about the elegant packaging and the look of the bar that I was very excited about – in fact I even hit the other bars first, saving it for last since I thought it looked so good. And it was good… it just – you know – didn’t have hunks of brownie or even that real rich creaminess that I tend to hope for with plain milk chocolate. Don’t be sad little chocolate bar, we can still be friends. I just don’t like you like you, you know – like that. Clearly overall the UK knows where it’s at when it comes to chocolate. Somehow unlike other well-known chocolate-loving countries it doesn’t seem to have the reputation for it, but maybe it should. Consider this post your official notice. Thanks to JP for sharing such an awesome collection and for making me want to book a flight across the pond, stat! Cheerio! Looks delicious! 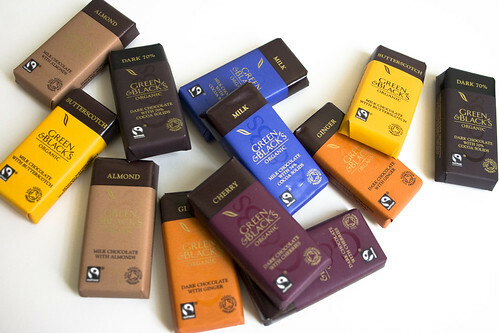 I love Green & Blacks and would so love to try the Choka Bloc. It looks great! 2. You need to learn to share better. 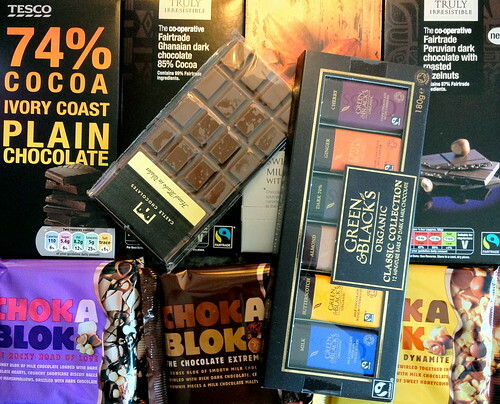 Not your chocolate, but your UK friends – I need some of them! Wow, what a gift. Be honest…how long did it take to work your way through it all? I agree with the labeling on the front of the package. I like to know nutrition information, but the loud display on the front detracts from the design. A quick note on the Tesco brand – it’s a supermarket chain in the UK. So they’re probably required to have the calorie information on the packaging. Awww! How SWEET of you! ;) To translate some British into American, “biscuit” is the word for cookie here. Also, I’m going to Switzerland in November, so get ready!